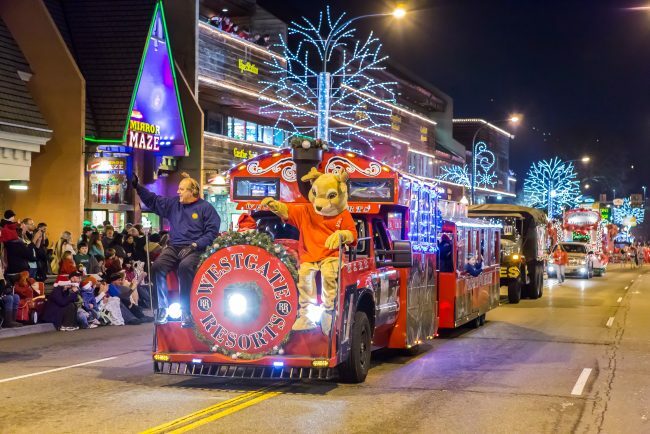 December 1, 2017 marks the arrival of the 42nd Annual Fantasy of Lights Christmas parade in Gatlinburg. It starts at 7:30 pm on East Parkway at Baskin Creek Bypass, (line up begins around 5:30 pm). The parade will roll into Parkway itself (at Light 3) and continue south down the strip, arriving at Traffic Light #10 by about 9 pm. This is one of the best Christmas parades in the nation, totally spectacular, usually with over 100 brightly lighted floats and festive vehicles, and attracting anywhere between 60,000 and 100,000 watchers lining the streets of downtown Parkway, all lit up itself with Winter Magic Lights. It will be a mile-long parade of glitter, tinsel, Christmas lights and general razzle-dazzle. We can expect huge cartoon character balloons, dancers, singers and entertainers, horse riders, several marching bands from Tennessee and neighboring states, contingents of the military in this patriotic town of course, and Santa himself will be there – that’s right, the real one! This year’s Grand Marshal is Del Byrant, son of the songwriters who penned the famous “Rocky Top” hit tune 50 years ago, Country Music Hall of Fame inductees Felice & Boudleaux Bryant. Parking for the event is available at Ripley’s Aquarium at Light #5 and the city’s garages at Light #3. Note that this year’s start is from a slightly new location this year, slightly closer in than the previous Light 1A, all still on East Parkway. You should arrive early for a good spot to watch the parade – some people will be parking their chairs along Parkway as early as the morning – and this year the organizers encourage everyone to wear a Christmas hat!